January 2004 saw electrical engineer Martin Dix embark on a life-changing event, which literally did begin with a light bulb; he knew it was 100 watts, but what did it mean in terms of cost? He thought it was odd that this fairly basic information wasn't more evident. Energy efficiency will always remain on the news agenda, but how can individuals and organisations change their energy behaviour. Martin decided the only way would be to empower households with real-time information. So, the Current Cost display was born. Realising the only way to make an impact and a difference was a large-scale, national distribution. Current Cost began working with DEFRA and OFGEM to create a device that would encourage behavioural change and should be included in their EEC programme. With design finalised Current Cost, DEFRA and OFGEM presented the new product to utility companies in the UK. Scottish and Southern Electric (SSE) agreed to the largest trial of its kind in the UK with 5,000 homes trialling the new monitor and since then a number of leading utility companies and other organisations have been supplying Current Cost monitors to customers and employees. The business, services, products and support grew through steep learning curves and in its first four years, 400,000 monitors were distributed throughout the UK. In 2010, with 1,000,000 units sold, Current Cost are the UK’s most experiences manufacturer of real-time displays and are focused on international expansion. 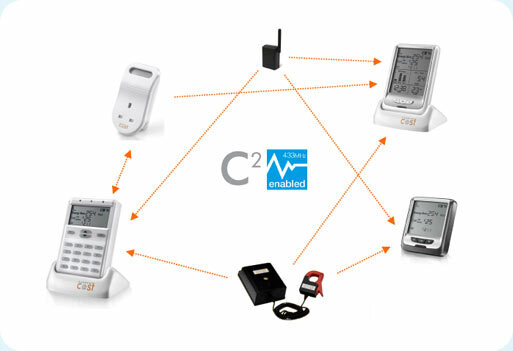 C2 is found in every device and now available in individual recognition plugs, standard meters, load management devices. The information gathered by the C2 software can be downloaded to a PC or as a part web application so households, housing associations and any other organisation can track improvement in energy efficiency and wastage reduction.